Interesting I don’t have time to watch the entire video right now. How easy is it to start? The problem I had with my Tarm wood gasification boiler was that it was a bear to start if the temp was below 140F the water jacket would just pull too much heat out of the fire box. It was not bad to start, his design is very good needs hooks or feet so it does not tip over but I imagine running this on pine needles it would burn like crazy. There has been some talk about that with the challenge CHP I think is right combined heat and power thread chris started a while ago. I think the issue becomes removing too much heat from the gasifer and making tar. I agree with the comment on the Tarm boiler. Combustion is hurt by pulling too much heat when just starting a new fire. One learns to feed the dragon before it gets too cold. Yup I had a 700 gallon storage tank it was really only a problem early fall or if I tried to fire it up mid summer for hot water. I do miss that boiler since I moved and left it in the old house. If I were to do it again I would seriously consider building the Russian designed masonry boiler which basically has a big radiator in the chimney but when you start it the smoke goes a different path. From what I have read they work great. One of the people online compared it to the tarm and said it starts better. 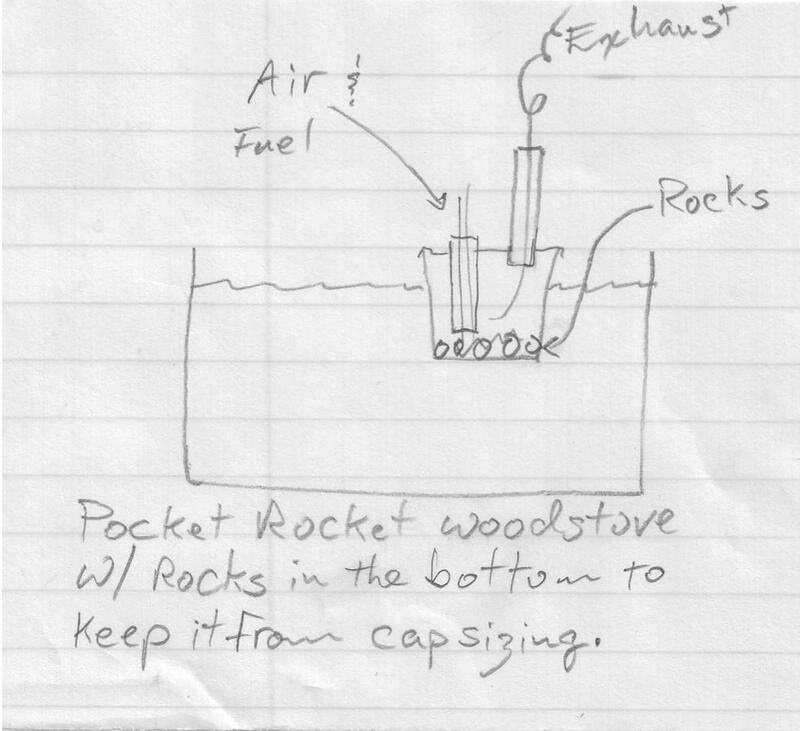 I wonder if a 'Pocket Rocket could be made out of a five gallon paint can, rocks put in the bottom for balast, and floated in a water tank. A floating stove might be a good way to evaporate maple syrup. Just use a livestock tank float valve to keep the tank full. watch the candy thermometer and ladle off syrup as sugar concentration gets high. PS. Be very careful to keep debris out of the syrup as you fire the stove. As I was watching the video a thought came to my mind. Could on do this but instead use the methods of a blast furnace where you keep feeding air into the fuel to make it burn hotter, except in this case all the heat would be absorbed by the water. The reason that this heats up the water so fast is how much surface area is touching the water I do believe, also at play is how much volume of air is in the main chamber. What totally baffles me is why does this stove does not smoke more than it does as shown on the video. Yes boiling maple syrup with this would take far less wood if it is as effective as what he shows, consider how little wood he used to raise that much water up to as high as he did. I was also considering that one could use something with far less thick metal as he showed in the video ( as you mentioned a paint can with thin metal ) as it does not have to stand up to much heat, all heat in theory would be taken away by the water. Perhaps a stainless steel pot… with rock / sand in the bottom of it. Looking at your paint bucket idea, It has me thinking, why not use a 100 gal propane tank and lay it side ways and put it in the water with legs on each side welded on. Then cut two holes for vents at the top for both the chimney and the wood feed, with rocks in the bottom to hold it down in the water. Do not you think that the fireplace works more efficiently outside the water, to keep the combustion zone as hot as possible and only recover the BTUs from the combustion gases? What totally baffles me is why does this stove does not smoke more than it does as shown on the video. Yup they don’t smoke much. I recommend you tinker with ‘Rocket Stoves’ and Top Lit Up Draft (TLUD) stoves, and Rumford fireplaces. There are a bunch of DIYers out therewho are making clean wood burning devices. Amazing what you can do with some tin cans and sticks. The idea is not new, or untried. I was in the USMC bask in the 80’s. They had ‘immersion burners’ that could use gasoline, diessel, and I suspect waste oil. One of their major benefits was that you didn’t need a supper high quality container for the water. A 30 gallon galvanized garbage can worked very well. I remember those from the 60’s. They could boil water in those garbage cans! Yes, if you are gong to make syrup a stainless pot would probably be appropriate.